The Grenada Tourism Authority awarded Mr Alwyn Enoe and his son, Mr Callistus Enoe, for their contributions to boatbuilding in Carriacou. The awards were presented at the pre-release film screening for Vanishing Sails on Saturday, 7 November, at the Carriacou Health Services in Hillsborough, Carriacou, as part of Caribbean Tourism month. “The award came to me as a surprise, although I’ve been awarded before at regional regattas. I keep the tradition of boatbuilding alive here in my village of Windward so that the youngsters will have something positive to occupy their times,” said Mr Enoe. 42 years later, Enoe continues to practice the art and skill of boatbuilding that he began at the age of 27. He has groomed his sons into shipwrights, and is keen on teaching others through a more formalised system. 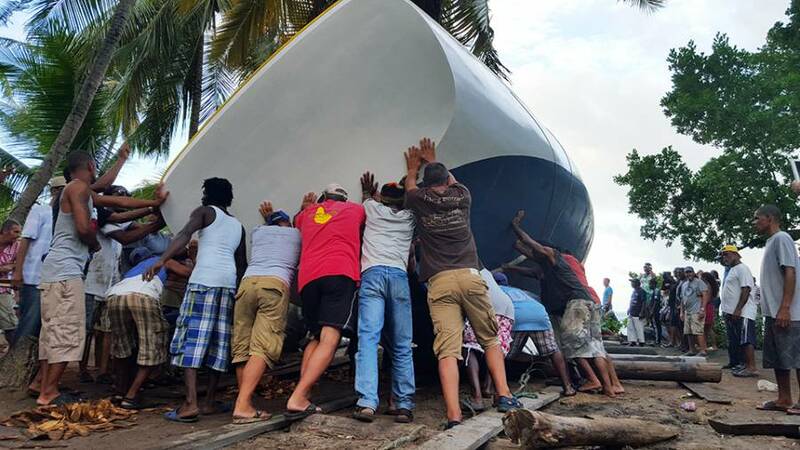 On Sunday, 8 November, scores of supporters joined the Enoe family to launch a 42-foot Carriacou Sloop, designed by Alwyn and built by Callistus. The boat launch drew much attention and excitement, completed with string band music and saraca food. About 50 men were actively involved in steering the wooden boat into its first splash of water. Traditional boat building is unique to Carriacou and has been a staple to the way of life of the people. It lends to trade, commerce, fishing, racing, and leisure, making it an exceptional tourism product of Grenada.